Vedantu.com - No.1 online tutoring company in India provides you the Free PDF download of NCERT Solutions for Class 7 Science Chapter 9 - Soil solved by Expert Teachers as per NCERT (CBSE) Book guidelines. 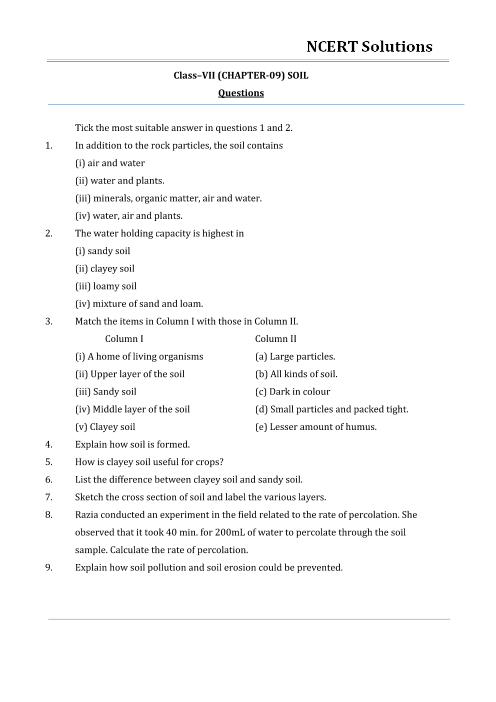 All Chapter 9 - Soil Exercise Questions with Solutions to help you to revise complete Syllabus and Score More marks. Register for our free webinar class with best Science tutor in India. Soil is one of the most important natural resources. It provides anchorage to the plants and supplies water and nutrients. It is the home for many organisms. Soil is essential for agriculture. Agriculture provides food, clothing and shelter for all. Soil is thus an inseparable part of our life. The earthy fragrance of soil after the first rain is always refreshing. NCERT Grade 7 Science Chapter 9, Soil deals with Soil, its nature and properties in detail. Soil Teeming With Life, Soil Profile, Soil Types, Properties Of Soil, Moisture In Soil, Absorption Of Water By Soil, Soil And Crops are the main topics covered in this chapter. Soil plays a major role to affect life on Earth. Its composition, types and properties help to understand soil that eventually aids agricultural practices. The ability of soil to absorb water helps to decipher the groundwater level. NCERT Grade 7 Science Chapter 9, Soil is an important chapter. Figures, illustrations, diagrams, activities and projects make this chapter very interesting and fun to learn. Exercises given at the end of the chapter, helps to develop a grip on the concepts and the students can assess their learning through them. Technical terms such as topsoil, water retention, percolation, etc. are introduced to the students that shall help them in the future while dealing with different phenomena associated to materials. Get 100 percent accurate NCERT Solutions for Class 7 Science Chapter 9 (Soil) explained by expert Science teachers. We provide solutions for the questions given in Class 7 Science textbook as per CBSE Board guidelines from the latest NCERT book for Class 7 Science. The topics and sub-topics in Chapter 9 Soil are given below. Ex 9.7 - SOIL AND CROPS. Chapter 9 - 10 Questions with Solutions. Other than given exercises, you should also practice all the solved examples given in the book to clear your concepts on Soil. Download the free PDF of Chapter 9 Soil and take the print out to keep it handy for your exam preparation.